Tiffany Mitchell Patterson, PhD, is an assistant professor of secondary social studies in the Department of Curriculum & Instruction/Literacy Studies. Prior to joining WVU, she taught upper elementary and middle school social studies for 10 years in Washington, D.C., and Arlington, Virginia. Mitchell Patterson earned her doctorate in multilingual/multicultural education and education policy from George Mason University. 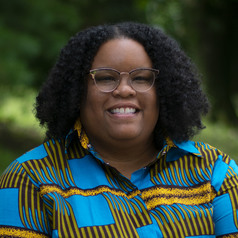 Her research interests include diverse civic education, action and engagement, teaching of social issues and movements, social justice and activism in secondary social studies, examining curriculum policies through a critical lens, teacher and youth voice in academic research and education policy, and utilizing archival research to uncover untold histories of people of color and underrepresented populations that could be incorporated into secondary social studies instruction. Advocacy, activism, intersectionality, social justice and anti-bias education lie at the core of her research and teacher practice. Education is her revolution.